Last Friday night's trip to the Carnegie Science Center was an all around good time. It was a good thing we had a crew of around a dozen of us to help as we had 200 people sign waivers and give unicycling a try. Once again, 0 injuries. Overall, unicycling is a relatively safe venture. And as many people discovered, it's challenging and FUN! 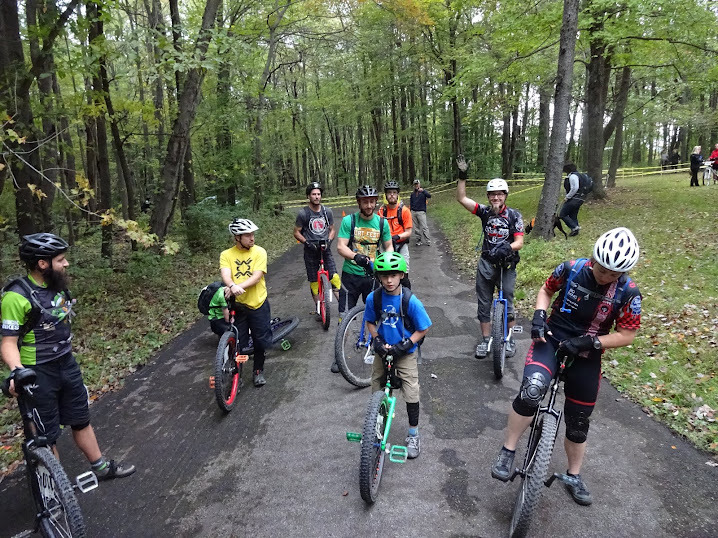 If you were there that night and are now reading this, we hope you'll join us again in a bigger space (The Wheel Mill or Butler YMCA) to really get the feel for riding. As always, we don't ask that you give up anything else you may already pedal. We just ask that you remember that unicycles are more than just circus props. As I sit here and type this, we're in the middle of the coldest day of the year. Let's hope this is it and Spring is around the corner. Let's look forward to riding comfortable again outside. 1. 6 Hours of Brady's Run- May 10th. This is a great race for Intermediate/Advanced riders. It's a mountain bike race, but there are Uni Solo and Uni Duo classes. The laps are in the 8-9mi range with a fair amount of climbing. Registration opens Feb 1st here: https://www.bikereg.com/Net/6-hours-of-bradys-run. 2. Dirt Fest- May 16th-18th. This is a great event for all levels of riders. We've been there every year. This year we will again have uni demos (like the Science Center nights) and a mUni group ride. If you decide to go, register under Group Camping and use Butler Wobble as the name of the group. If we have 8 or more (like we did last year) we get a site to ourselves. Ask anybody who has gone to Dirt Fest about how much fun it is. The trails at Raystown are unlike those around here. They're fast and swoopy and not super technical. More details can be found at www.dirtragdirtfest.com. One last item: we're still on throughout the winter for Fridays at the Wheel Mill and Saturdays at the Butler YMCA. This Saturday is the first Saturday of February, so we'll be going to The Chop Shop for dinner after practice. We hope you'll be joining us. Last night's overall winners of the Skinny Contest were Daniel Collins (for the males) and Danielle Millett (for the females). A huge thanks to The Wheel Mill and G-Form for inventing and sponsoring the event. G-Form awarded a set of pads for each winner! The 15 minute jam format was a lot of fun, but the contest was only the beginning of the evening's good times. Hopefully we'll get to see the official pics from the contest sometime soon. Friday night mUni nights at The Wheel Mill have indeed turned out to be fun for the entire family. Last night we had riders ages 10 and up. Up didn't stop at 40 either. As always, don't forget we're at the Butler YMCA indoors on Saturdays from 4:30-6:30. Feb. 1st is coming soon and we'll be heading out to eat that night after riding.